I'm a fan of the sponge. Really. They're everywhere you look. In the ocean, lakes, swamps. And quite cool. Blender them up and they re-form themselves. 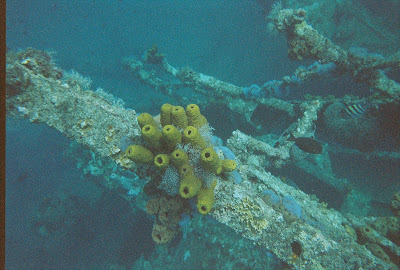 The wreck of the Antilla was covered with these yellow tube sponges. If I'm philosophical I can say as a writer I'm a sponge. Soaking up everything around me and then re-packaging it. I'll be at the store and hear a woman talking on her cell phone and I find myself imagining the scenario. Of course it's not just her calling her husband to ask what he'd like for dinner. It's really she's calling her operative and giving them the password to defuse the bomb to save the world. The man in the parking lot isn't trying to figure out where in the heck did he park his car. He's a mastermind criminal who's scoping out how to rob the jewelry store next door. The two boys on their skateboards? The old woman in line ahead of me in the drugstore? Is buying cold medication to make meth. When I get home. I see Tooloose. Coming toward me. Instead of a normal everyday cat - I see a powerful super hero animal that can - with one slinking rub with his body - turn a person into a zombie who waits on him hand and foot. So what do YOU imagine? I see different things depending on my mood. Sometimes, when I'm in a video game store, I'll see children playing. There's video games everywhere. They're happy. It's kinda sweet. But sometimes I see the same scene and the children are foaming-at-the-mouth demons, cackling and spitting at everything they see. I close my eyes and pray I don't get beaten. And recently, I went up the street to vote (early voting). The polls were at a small, seemingly abandoned grade school located in a park. Although nothing was too amiss, I imagined my surroundings a hair away from turning Silent Hill on me. Loud sirens would wail, the sun would disappear, and the kids playing basketball would slowly lumber towards me as I noticed they had no eyes, three mouths, and foot-long spiked tongues. Sometimes, just going outside is fun as hell. Off topic, I found this blog through Nathan's blog. And it was funny, yesterday as I was cleaning my apartment after a pipe burst, I was taking books off our wet bookshelf and saw Lottery (worry not, wasn't damaged). Apparently my girlfriend owns it! I'll have to give it a read. Yeah the monster aspect is too fun. I blogged about the whole horrendous ordeal. It came from a burst pipe in the wall separating our bathroom and our living room. There was actually no visible water damage on the wall of the bathroom, but there was a pile of minerals around the drain of the tub. We're thinking the tub overflowed? Somehow? Never thought I'd have to deal with a flooded apartment living on the 8th floor! Pat: Internet seems to be the biggest problems to plague writers: For the unpublished, the Internet is a huge distraction, and for the published like yourself- you have deadlines to meet but are also encouraged to do online promoting as well as book tour, etc. 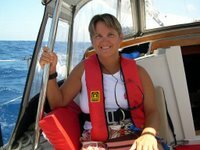 Have you considered a virtual assistant? I know RITA award winner, Linnea Sinclair has one to help out with her online stuff/email. I see things depending on my mood, too, but mostly I see them as photographic possibilities. Which means that when I saw a little boy playing with a tree frog against a bright blue wall, I didn't see a little boy tormenting a helpless animal or a little boy getting dirty. I saw a little boy giving me a gift -- a tremendous photo-opportunity. After I was done snapping photos and we exchanged a smile, I knew I'd also found one little boy who appreciated a grown-up seeing something just a little bit different than most . . . one big person didn't yell at him to put that thing down or cringe at the yuckiness of a frog (because I knew it was beautiful, too). Or, maybe "cool" is a better word than "beautiful". LOL Little boys are really fun. Depends on setting and mood. Around here I am quite often wondering how I would have survived as a pioneer person. Trying to imagine life without my comptuer, very scary. I have always had adventures, when small my dolls were never "baby" dolls. They were always a jungle explorer,or a queen. So goes my life, I escape into my daydreams. I imagine.... huge swaths of uninterrupted, peaceful writing time. Over and over again, this is what I imagine, not that I ever get it, of course! Always do this too. Must be a writer thang...but it can drive family and friends crazy. There's just no way to stop the character/plot driven scenarios from rolling out, though, when sparked by something interesting. And isn't it just about ALL interesting? What DON'T I imagine? Not much. I get inspired by anything and everything. It's both a blessing and a curse, because I have more ideas than I know what do do with! At least I'm getting better about sorting the good from the bad and so-so. By the way, I'm a huge fan of sponges myself! I like to imagine the "What ifs?" What if whoever said woman was calling didn't answer, causing her a delay b/c she had to try again, then leave a message, and that delay triggered her walking out of said store two minutes later than she would have, so she walked straight into a crime she otherwise would have missed. And so the story grows.